Not all of it succeeded, I have to say. I before E except after C fails to stand up to repeated listenings, and quite what Alison Moyet thought as Vince Clarke intoned The Lord’s Prayer over her vocal on In My Room, I cannot imagine. This evening’s venue Glasgow Tiffany’s was more a night club than a concert hall, and I recall us watching the gig from some sort of balcony, looking down almost vertically on top of the stage. A band called Scream provided the support, but I think we missed most of their performance. 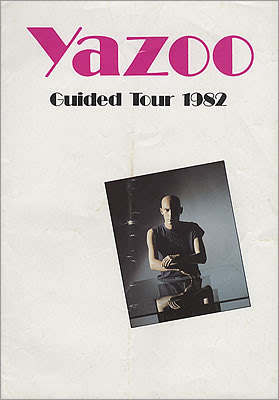 Yazoo’s set opened with Situation, a song then hidden away on the b side of Only You but which, after a dance remix, would go on to become a hit in the States. And is arguably, now the band’s best known song. They then set about performing note for note versions of the majority of the Eric album, although thankfully we were spared the I before E experience. Instead, when Alison went off for a pee, Vince set his sequencers running playing an instrumental (I later discovered to be called Chinese Detectives), whilst he crept around the stage with a camcorder in hand filming the audience. Whether this footage appeared on a screen downstairs, or turned up somewhere else, or indeed if the camcorder was all just for show I never knew. The set proper closed with the new single The Other Side of Love, and the final encore an extended version of Situation, which suggested even this early the pair realised the song was just a bit special. This tour was the duo’s first, and it would be 26 years before their second although, to be fair, both were hardly inactive in the interim. Moyet carved out a successful solo career for herself, whilst Clarke went on to form Erasure. Of more later.